As early as 1620, the Dutch Captain Cornelius Jacobsen Mey sailed around the Cape in his ship "Glad Tidings." He was very much attracted by the territory and was delighted with the balmy climate which he compared with that of Holland. He named the land for himself and it is still known as Cape May. It is said that numerous New England settlers made their homes in Cape May County and many of the descendants of the "Mayflower" are to be found here. During the Revolution, the Cape May pilots struck at British coastwise shipping and the residents remaining ashore acted as anti-British spies. These Patriots relayed information by pony express to Philadelphia by galloping through the Pinelands quite a distance away. There was also a company of 'Minute Men" from Cape May. This company was independent of the Light Infantry and Rangers but their uniforms conformed as nearly as possible to the uniforms of the riflemen in the Continental Service. The town of Cape May later became a famous summer resort and its beautiful stretches of sandy beaches attracted many fashionable people of the day. It was known as the vacationland of the Presidents as Lincoln, Grant, Pierce, Buchanan and Harrison vacationed there as well as a great many Congressmen. 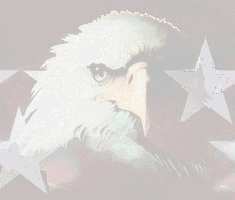 Tribute is paid to the Cape May Patriots who helped in their own special way the cause of freedom. Sarah Stillwell was a local Revolutionary heroine. Her story is one of touching devotion to her imprisoned husband. She was the daughter of Nicholas Stillwell, who was the son of John Stillwell of Town Bank, Cape May. Her father bought a plantation at Beesley's Point in 1748. The house has been rebuilt several times until now it is quite a large building. For many years it was the home of Miss Mabel Clay, a former State Regent of New Jersey. 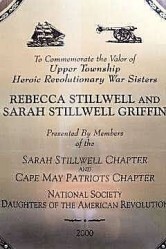 Sarah's brother, Captain Nicholas Stillwell, fought in the Revolutionary War and her sister Rebecca was also known for her brave deeds at that time. The Stillwell home was situated on the southerly shore of Egg Harbor Bay and one morning a British Sloop appeared there. As it happened, no men were at home and so Rebecca ran to a small cannon which was in the yard and fired it. The sloop sailed away. Sarah Stillwell married Captain Moses Griffing, who, toward the end of the Revolution, was taken prisoner by the British. He was placed in the ill-fated and scandalous New Jersey prison ship maintained by the British. Here the wounded and dying, the starving and the dead were huddled together in terrible proximity. When Sarah heard of the awful fate of her beloved husband, she vowed to visit him and ask for his release or die in the attempt. Her love and devotion sustained her over a hundred miles through woods filled with marauders and Tories. On her journey, she came to General Washington's Camp. Washington placed under her charge, a British officer whose rank was equal to her husband. She safely reached New York and after long hours of pleading and painful apprehension, Sir Henry Clinton yielded to the urgent pleas and her husband was exchanged. And so this true story ended happily for both. Of such acts are heroines made and the Sarah Stillwell Chapter remembers with admiration a loving and faithful wife. Turtle Gut Inlet, once located in the vicinity of Toledo Avenue in today's Wildwood Crest was, at one time, the division between Five Mile Beach to the north and Two Mile Beach to the south. Filled in by the county in 1922, it has long been forgotten but its history has given us much to remember. The Battle of Turtle Gut Inlet, a little-known but authentically documented naval encounter during the Revolutionary War, took place on June 29, 1776. The importance of Philadelphia to the Colonies as a port made it absolutely essential that merchant ships bound there with supplies be given safe conduct. To accomplish this, a constant effort to elude the British blockade of Delaware Bay was carried on by the ships of the Continental Navy, ably assisted by the sloops and brigs native to the area of Cape May. The pilots of these small boats knew the region well and were especially adept at dodging in and out of the small harbors and inlets to escape capture by the British. It was at one of these inlets -Turtle Gut- that a naval battle was fought. On Friday the 28th of June,1776, the brigantine, Nancy, was sighted off the coast of Cape May. Under the command of Captain Hugh Montgomery, she was bound from the Virgin Islands with a cargo of munitions for the Continental Army. As the Nancy came into view, an urgent message was sent to Captain John Barry of the Continental frigate Lexington, anchored near the mouth of the Delaware Bay, that two British warships were already pursuing her. The Lexington, accompanied by the continental frigate Wasp, set out to aid the Nancy, anchoring close to Cape May to wait out the night. In the early light of dawn, Captain Barry sighted the Nancy heading in for shore with the British warships in hot pursuit. Realizing the necessity for quick action, Barry ordered out the barges from the Lexington and Wasp and, taking personal command of the expedition, directed his oarsmen toward the Nancy. They found the brigantine hard aground in Turtle Gut Inlet and under heavy fire from the British warships. Barry and his men boarded the Nancy and began the double operation of manning the Nancy's guns to ward off the attack of the warships while, at the same time, unloading the valuable cargo of munitions and storing it safely ashore. The Nancy was taking a terrific bombardment from the enemy guns, but somehow managed to return enough fire to discourage a boarding party from the warship Kingfisher. Barry knew, however, that he and his men were already on borrowed time. Though only about two-thirds of the precious cargo of gunpowder had been unloaded, Captain Barry ordered the men to abandon the ship, but not without leaving a calling card for the British. He ordered about fifty pounds of gunpowder to be poured in the ship's mainsail, and wrapped as tightly as possible. This would act as a fuse leading to the remaining powder below deck. With their men safely in a boat alongside, the two Captains set fire to the mainsail and jumped over the side, but the last to leave the ship was reportedly a seaman who stayed behind to retrieve the ship's flag. They made the few hundred yards to shore safely, stopping only to pull the seaman, and his precious flag, into the boat. Meanwhile the long boats from the Kingfisher had taken the lowering of the flag as a sign of surrender, and closed in quickly to board the ship. The first seven British sailors who reached the Nancy, raised a cheer of victory as it exploded with a roar that, according to record, "was heard forty miles above Philadelphia." Thus by noon on June 29, the Battle of Turtle Gut Inlet had ended. The enemy ships retreated, and the precious gunpowder was loaded onto the frigate Wasp, and sent safely up the Delaware Bay. It was a proud moment in the history of our country, and an important step forward in the career of young Captain John Barry. By 1974 he would be known as Commodore Barry, "father of the American Navy". A marker commemorating the Battle of Turtle Gut stands today at Miami and New Jersey Avenues across from Sunset Lake, in Wildwood Crest, New Jersey. (C) 1976 Wildwood Crest Historical Society. Used by permission.